One of Miffy’s favourite things to do on Christmas morning is to open her stocking! 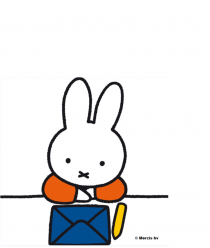 Mother Bun usually fills it to the brim with little treats which keep Miffy occupied through the Christmas holidays. Here are six of the sweetest Miffy products to fill your stocking with this year – and they’re all £10 or under. Talking Grunty, £10, available HERE. Miffy Washable Pens, £4, available HERE. Miffy car, £7, available HERE. Miffy coaster, £3, available HERE. Miffy plush, £7 each, available HERE. Miffy Art Poster Set, £5, available HERE.